The transition from using tables to create a page layout to using Cascading Style Sheets can be difficult to grasp at first, particularly when it comes to positioning elements correctly on the screen. In this video tutorial by Practical eCommerce’s chief architect Brian Getting, we will take a look at the various methods that CSS provides for positioning page elements, and how they work. 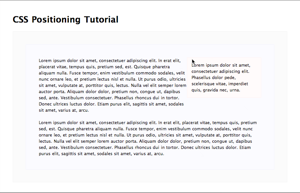 The CSS float and position properties allow designers to fine-tune where they want particular page elements to appear. However, they can be confusing to understand at first, and in this tutorial we will examine what each property does. By showing how to take advantage of these positioning properties, designers will be able to make more informed decisions when they are planning their CSS-based page layouts.